Coleco cashed in on the Pong craze in a big way. They managed to grab a huge share of the early home video game market partly through good marketing (their original Telstar console was half the price of Atari's Pong) and partly through good luck (Coleco was the only company that got their full shipment of the popular microchip that everyone used to manufacture their home Pong systems in late 1976). 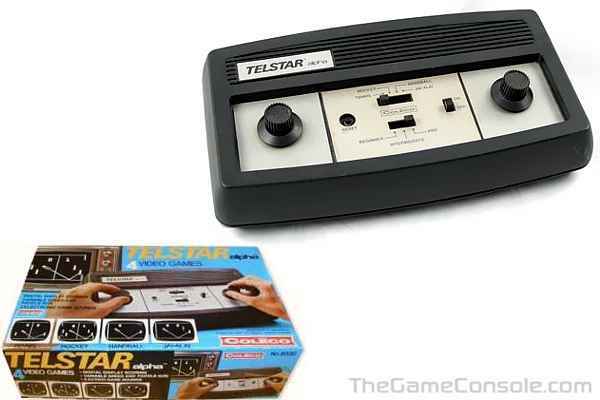 The Telstar Alpha (model 6030) was released in 1977. It is a classic from Coleco, and uses the AY-3-8500 game chip. The system plays 4 games in three difficulty levels. It is the successor of the three older models (Telstar, Telstar Classic and Telstar Ranger), and only differs by its case and fourth game (JAI-ALAI, also known as SQUASH). Like the first Telstar, this system was sold in large quantities as it was cheap. It was also released in Europe as the "Telstar Alpha Europa".